Is it better to buy all the same brand? Plasma vs. LCD? Is it good to get all the same brand? Ever wondered whether you should buy all SAMSUNG? or all LG? Do you need to get a SONY DVD surround sound system with your SONY TV? And more importantly; is it a good thing or a bad thing to get all the same brand? 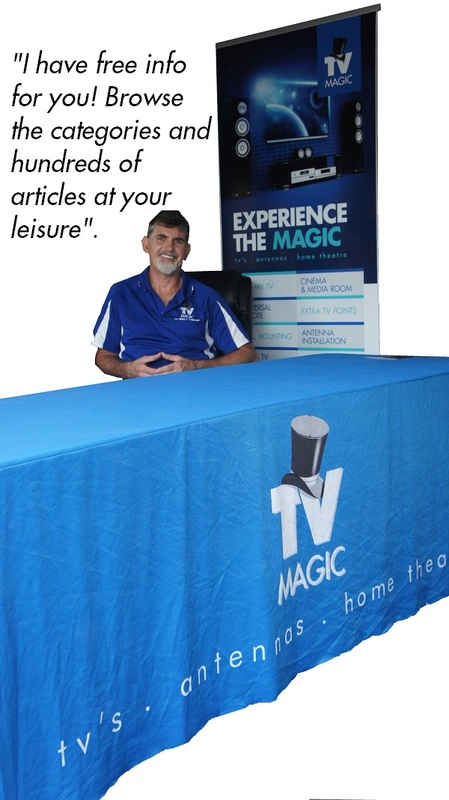 TV Magic are home theatre installation experts and we know that getting all the same brand can at times cause compatibility issues. Read on to learn more! The above are questions that not many people ask, but should be. Generally any TV setup and installed correctly, using the correct cables and so forth will give a fantastic picture now a days. Notice we said 'correct cables' not 'the gold plated, most expensive cables'. Do you really get what you pay for? Sure. A $4000 price tag will have a higher performing panel than a $1000 one for the same size. It's when you are comparing what it is that you need/want and your budget that can cause all the confusion. The features and the terminology is what throw a lot of people off. What does 16:9 mean? Refresh rate? Progressive? and so on. Do you really need this? Or can you afford not to have that? If you are not familiar or you don't understand the features of flat screen televisions, our advice would simply be this - go with someone you feel is not selling just for the commission and go with your gut feeling. Secondly, get it setup properly. Professional TV installation by an experienced TV technician is the key to getting the most enjoyment out of it. Should I get all the same brand? Sometimes yes, sometimes no! There is a thing called 'IR clashing'. IR clashing causes disturbance/unwanted control of a device from another device's remote control because they are the same brand! This admittedly, is very rare but usually only caused by same-brand equipment! Therefore this would be one reason as to why you should not get the same brand in case you fall victim to this scenario. More often than not, a consumer finds out months down the track when the DVD tray keeps popping out every time they press 7 for example! For anyone reading this, this is more common than you might think! There will be quite a few readers that have experienced this or know someone who has! On the other hand, there are some fantastic advantages with having the same brand equipment. 'Smart linking' like Panasonics 'Viera Link', Sony's 'Wega Gate' etc can make a system much easier to use but once again, so long as the system has been setup properly. Why shouldn't I choose a TV from the shop that has the best looking picture? In fact you should probably ignore what's on the screen if you don't have a clue about televisions! Seriously! It's all to easy to hook up a screen with a cartoon DVD, use the best cable and get that 'wow picture' and sit it next to an old black and white movie on the screen next to it to give the effect that the screen has "the best picture you've ever seen!". Another thing that TVs in the shops are set to is STORE/DEMO mode. This cranks up the brightness and 'DYNAMIC' mode to give a more outstanding picture. The truth is - Why is there such a huge discount on a display model TV? The answer is the TV would not last more than 2 years running on that setting! 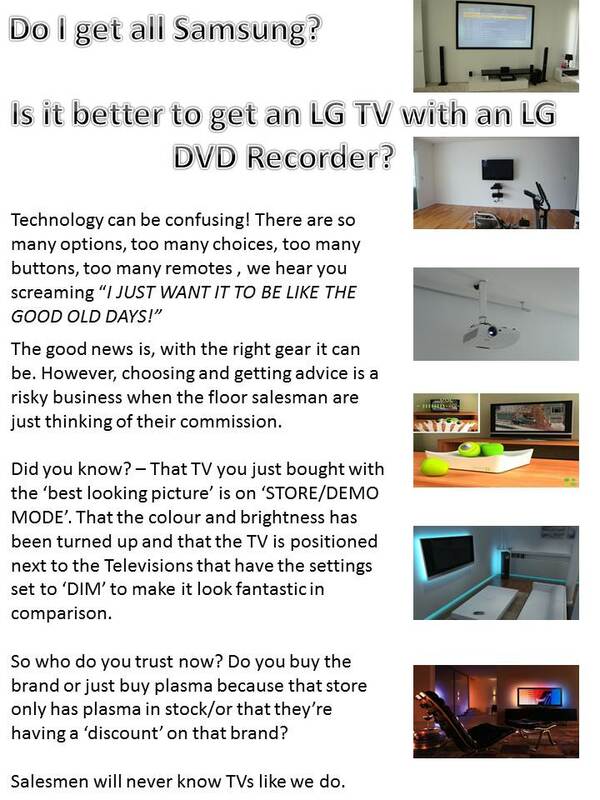 Why should I qualify the TV sales rep? Not all salesman are clueless, just many! They have their own point of view on televisions (usually one that has the most margins) and the training that they receive is usually biased towards the business's pocket also. Naturally. Finding a good salesman is like finding a needle in a haystack. We suggest you find a MR (or MRS!) that has min. 5 years experience. By 5 years time they should know which features are actually going to benefit you and which ones are just blowing smoke up your chimney. Depending on your needs and wants, the brand new, latest features may give you absolute delight - but for others they could be an absolute waste of money. Let's look at 3D for example. When 3D panels starting coming out (if you bought one early and you're unlucky enough to know what I'm talking about) you'll probably agree that the glasses weren't too crash hot! The glasses flickered and gave you a headache! Also, you probably havn't watched 3D in about 2 years now and would never buy a 3D TV again, right? Getting the right TV or gear for your home entertainment is a challenge. We're not even necessarily saying that you should trust us to supply your gear! One advantage is that we don't have biased advice on brands or models that we need to push out the door so if you want to consult with us for your gear - we'll definately give our most professional opinion to you. The other reason you might let us supply you your gear is - we have no loyalty to any particular shop yet, we still have all the contacts. We guarantee that we will get the purchase price lower than what you would purchase the TV for even if you haggled them. This allows us to use that margin to go towards - free delivery/installation labour etc. Oh, we also provide a free replacement warranty for all goods we supply. If you bought a lemon from the shop/s and 6 months later it failed, you would have weeks/months of waiting for the equipment to get sent away and sent back again etc. With TV Magic we will come and replace it on the spot without the waiting! If you have any questions about what gear to buy contact us!